The General Store is located on the front of the farm. 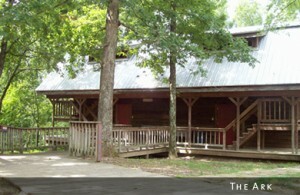 This small building is currently used for a variety of needs, but seldom on a daily basis. The Picnic Pavilion is complete at the northern end of the lake! 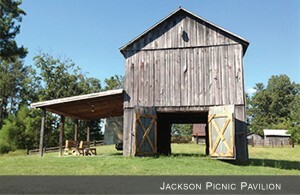 The old 2 story red tobacco barn was originally built in the 1940’s. Through the combined efforts of many craftsmen, Summer Camp Volunteers and Campers, the necessary renovations have been made to host gatherings of several dozen people at the lake. 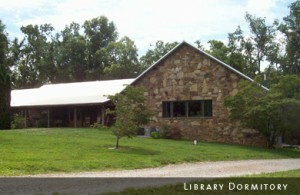 The Library Dormitory contains beds for up to 26 guests, along with two well-equipped bathrooms. This dorm is located in a nicely finished walkout basement, and is often cool year around. So be aware and prepared if you choose to sleep here! Attached to the Manna House Conference Center is the Library Meeting Room and Dormitory. The Library Meeting Room can be set up to accommodate most any teaching need. Seating with tables is often the preferred environment, and can comfortably accommodate more than 100 people. Chair seating for 175 is possible with no tables set up. The meeting room contains a warm rustic interior of wood, along with a large stone fireplace for a comfortable place of fellowship throughout your stay. The Lodge Dormitory offers 5 bedrooms from which to choose. A clean and comfortable environment (cool in the summer and warm in the winter) allows 8 to 14 guests to room together, with a total capacity of 48 guests. This dorm can accommodate separate sleeping arrangements for men, women and families. The Lodge Dormitory also contains a Commons Area where a fully equipped kitchen is located, along with tables and comfortable seating. A warm rustic interior of wood and radiant heat floors (in the winter) will also provide much enjoyment. 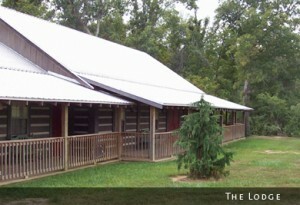 The Lodge has also been constructed with a large wrap around porch to provide another welcomed place of fellowship throughout your stay. 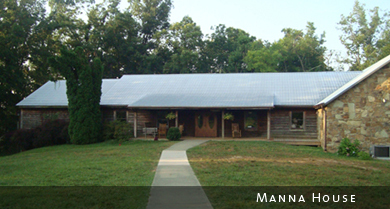 The Manna House Cafeteria serves us with a large multi-purpose room, along with a fully equipped kitchen able to prepare food for well over 130 people and small meeting rooms. A warm rustic interior of wood, along with a large stone fireplace, will provide much warmth and a comfortable place of fellowship throughout your stay. The Quiet Cabin was built to accommodate individuals, small groups or families who wanted a quiet place to relax and reflect. It is located well off the beaten path of the other dorms and the cafeteria. There are two bedrooms, each with their own bathroom, and a loft above the great room to provide sleeping for a total of 8 guests. 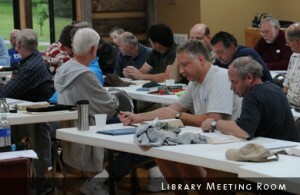 The cabin can accommodate separate sleeping arrangements for men, women and families. 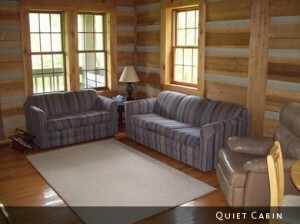 This is a well-furnished cabin with a fully equipped kitchen and two porches. Oh, one more thing. 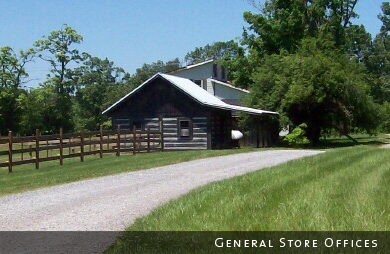 There is no satellite, cable vision, Internet, or phone line to the cabin in order to complete your stay in solitude. After all, it is the Quiet Cabin. 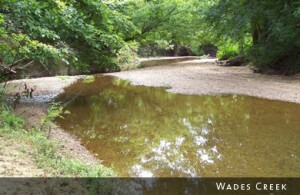 Wades Creek runs through the southeast corner of the property. On the southern end it runs just behind the Ark Dormitory. On the eastern end it bends about 100 yards behind the Quiet Cabin. These locations provide our two favorite points of entry to wade the creek. With a rocky bottom you will want to be sure to wear some secure footwear. Pool depths seldom exceed 3 feet, and are routinely much lower between pools. We do not allow wading in the creek during or after a heavy rain. It is a large creek for this part of the country, and water depth can rapidly change during a heavy rain to exceed 5 or 6 feet. The Lake is located in the woods about 100 yards west of the Warren’s home. Currently there is a good walking trail and a dirt road to the lake. 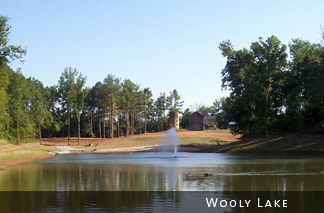 The 4-acre lake provides a quiet place to relax, as well as great fishing.